I watch a lot of what some would call "the classics," not because I think they are superior to modern movies or anything like that - I just get a kick out of some of the old movies. There are some problems present with watching older movies though - namely, sometimes they show their age in unpleasant ways. 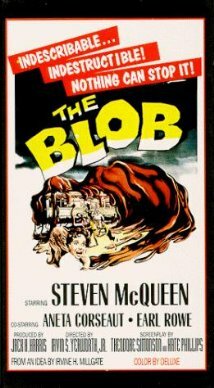 Blob is a bit of a big thing for the little town it was filmed in, evoking a yearly Blob-fest that even involves a prized running from the very theater in the film to celebrate. Of course, I'm getting ahead of myself - simple fan status doesn't really always merit the movie being good necessarily, but please do continue. Space was a big thing back in the day - big enough to be present in a lot of different movies. In the case of Blob , teenage sweethearts Steve (Steve McQueen) and Jane (Aneta Corsaut) are out watching the sky when they witness a shooting star makes impact somewhere nearby. As they go and search for the crash site by car, random old man living out in the woods finds it himself and does what any good normal person would do - pokes it with a stick. The poking causes the meteorite to crack open, and he in turn decides to poke the gooey center with the stick. Well, as it turns out, gooey centers don't like being poked, but do love eating whatever they can come in contact with - which just so happens to be the old man's hand. He cuts off through the forest at the brisk pace of a person who feels like their hand is being eaten, where he almost gets hit by Steve and Jane in the car. Noticing the old man is in some kinda pain over the weird thing on his hand, they drive him out to the doctors. From here, events continually spiral out of control, with the blob gaining mass the more people it eats (and it does eat oh so many people) and generally terrorizing the town in secret while the police believe the entire ordeal to be some sort of prank by the kids. Of course, Steve and Jane know the truth, and go about trying to do all they can to make the town believe them - a plan which is generally failing until the final act, which culminates with the theater run and over-sized blob that's plain impossible to not notice and believe. I should note, the blob itself is the only major effects in play in the movie, and its actual size doesn't really change. Through some clever practical effects work (such as using a picture of, say, a diner) the perspective makes it feel as though the blob is far larger than it is. The non-rating doesn't come for any particular reason (outside of probably being released before a real ratings board existed), as what could be considered violent (such as the blob dissolving people) takes place entirely off screen - even if the blob itself is not. It's an intriguing thing to me, at any rate, that such a simple little thing that's essentially no more than a prop can become a character. "... show its age in various places..."
Now, the film does show its age in various places - from the outfits, cars, and lingo dating it to a very specific era to the audio track falling apart at times. Granted, the cars and lingo all fit the time period feel of the movie, but the audio is a bit... disappointing I guess is the best way to describe it. There are several occasions throughout the film (I watched the Criterion Collection version, if that has anything to do with it) in which the audio must have either been lost or damaged, or something, as they decided to come in after the fact and re-dub over it. Usually, this would be all fine and dandy, but it leads to a loss of synchronization of the mouths of the actors and the words they say, creating a Godzilla-ish goofy experience where the actors don't sound quite right and the bit doesn't feel quite right. The other lines are, oddly enough, always understandable and delivered well, so it in turn just makes the re-dubbed parts seem that much more out of place. Acting is on par with most movies of it's time period, with some actors doing a better (or more believable job) than others. Little bit's of character information pop up from time to time - such as the history of one of the cop's and why he seems to dislike all the kids in the town so much - but nothing much more than what is necessary to know outside of that. A classical soundtrack supports the video on screen from time to time, and nothing really pops out and feels like it's beating you over the head as the movie runs its course (unlike some modern "This is how you kill it!" instances in movies, where we then get a 10 minute lecture on why it actually works). It also doesn't dwell too much over the course of it, and as soon as it gets things rolling it keeps a steady pace to the finish line - only a brisk 82 minutes long. We could really think more into what's presented that I have if we really wanted to. I mean, I guess anyone could think pretty deep into most movies and see how it reflects on society at the time, and all the worries of the day - like how movies worried about aliens, or radiation, or the terrors of war. Sure, we could look at this as a commentary about the fear of the unknown, or a sly warning about taking care of the environment (you'll get that one right at the end. It's pretty blunt about it). We could look at how the town bands together to try and fend of this creature as soon as they see proof of it's existence , even if the other kids believed Steve's story before the proof was presented. We could dig a lot into things, but really, I don't feel that's the point here. "...one of the perfect drive-thru type movies..."
The Blob to me is one of the perfect drive-thru type movies. It's cheesy, it's kind of old, but it feels like a movie that you and your family or friends would all pile into the car and to go and see, with the entire purpose of just enjoying yourselves. We don't waste any extra time on why the creature is here, or why it does what it does. It simply is, and people act in a believable way according to their characters. It's not too long, so it could easily be double-featured with another film, and I feel it just fits that sort of atmosphere. It's a fun little movie - no doubt not everyone's cup of tea - that isn't so much an actual scary movie as it might have been back in it's heyday, and time might have not been the kindest to it, but I know I had fun with it.